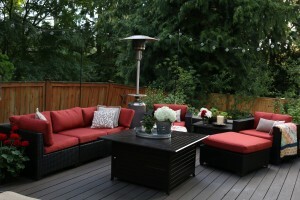 I just looked up how many years it has been since our deck makeover with Behr Deck Over. 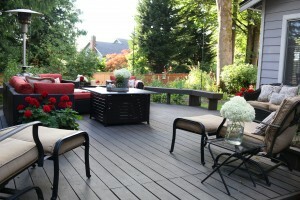 I first posted about Behr Deck Over in July of 2013. In case you are interested, here’s the first post. It’s been 4 years and our deck is just now starting to show some wear. We live in the Seattle area and, if you haven’t heard, it rains a lot here. We jokingly say that Summer starts on July 5th because it’s been known to rain on the day that we’d all like to be out at a family BBQ. Once the weather takes a turn for the better, we usually have a pretty nice summer! That doesn’t mean that every single day is clear skies and sunshine, but if it’s not raining you can find most of us outside. Our deck gets a lot of use in the summer and we need a product that will hold up to dog and teenage party traffic. 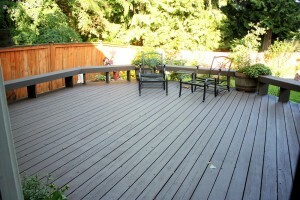 Here’s the link to the second post about Behr Deck Over, if you are interested. Here is our deck in 2013, when we had just pressure washed it. 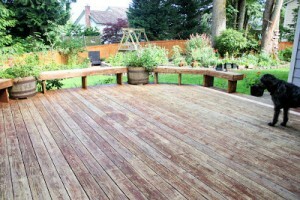 And here is our deck after painting Behr Deck Over onto it. You can see that there is a lot of space, which meant a lot of painting, and also meant that we didn’t want to tackle this project every summer. For the past few summers I’ve given the deck a light scrub with a push broom, some outdoor cleaner, and a hose. It’s worked great to get the pollen and green gunk off of the boards. The Deck Over held up perfectly! So, here we are in 2018. I just had a stroke and the deck is finally showing some wear. 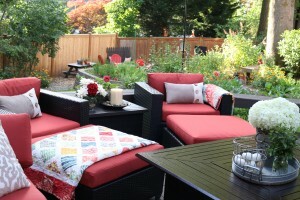 This needs to be the summer of Behr Deck Over Round 2. Unfortunately, I have been on a strict “do nothing” routine prescribed by my doctor. No repetitive movements like painting or exertion of any type that might hinder healing in my artery. Fortunately, for me, my kids were my chief workers with Behr Deck Over Round 1. At that time, they were 9 and 13. Fast forward 4 years and my kids are even better workers at 13 and 17. I’ll just sit in a chair in the grass and tell them when they miss a spot. Seriously, friends, this is my happy place in the summer. Once the dry weather hits you’ll find me in the corner of that couch with the fire going and the heater on full blast. (I said it gets dry here, but most days aren’t too warm.) 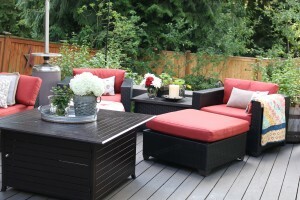 I plan to use Behr Deck Over again and I’m hoping they have the same color. I want to say the name either had something to do with chocolate or coffee. It was the perfect color. Our house is a light gray with white trim. Although I love the look of a white deck, that’s not the best idea when you have kids, a dog, and green blecky stuff that seems to grow on everything around here. It’s Behr Deck Over for the win! Happy painting!